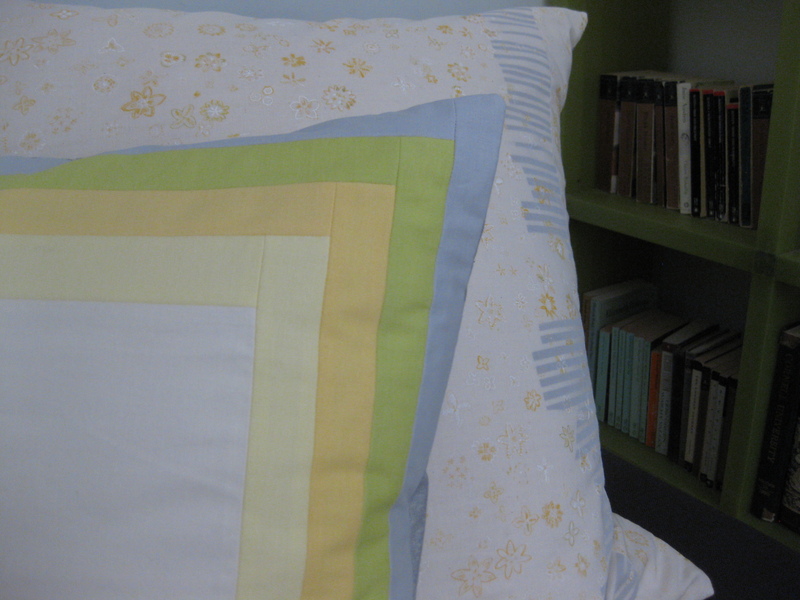 This daybed quilt is very easy to make and can be customized to fit any size daybed. The design is essentially an off-center housetop. The main solid color is the only part that shows when your daybed is made up–plain and simple by day with some hidden quilty loveliness. Quit top: Three solid colors (approximately two yards of your main color, and one yard each of your two accent colors.) Small amounts of print and contrast color if you want to add some pizzazz. Binding: About one yard quilting cotton. First, measure the area of the mattress top. Cut a large rectangle of your main color (I used Kona smoke) the same dimensions are the mattress top plus one or two inches all around. Next, determine how much overhand you want. 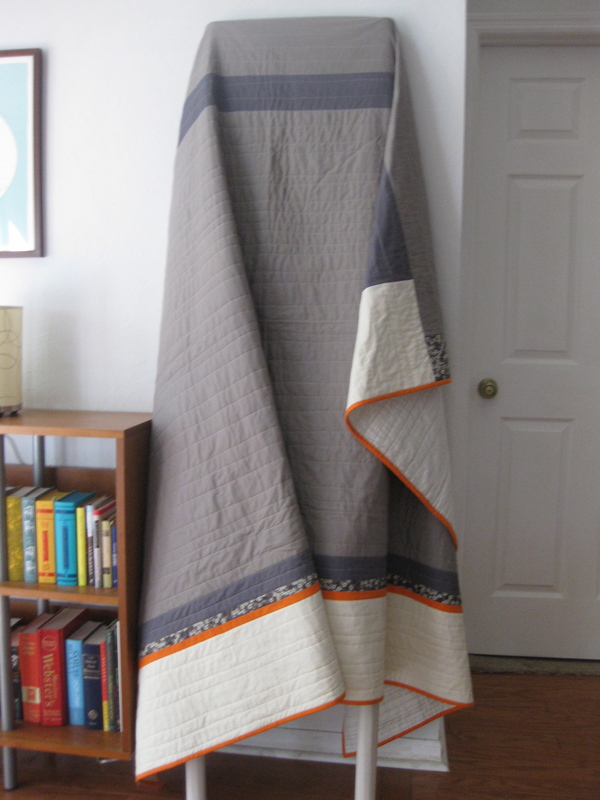 I added about 12 inches to three sides–to allow the quilt to tuck neatly into the mattress. Cut enough three or four inch strips in your second color to frame your main rectangle. Add the rest of the length and width to the bottom and edges. 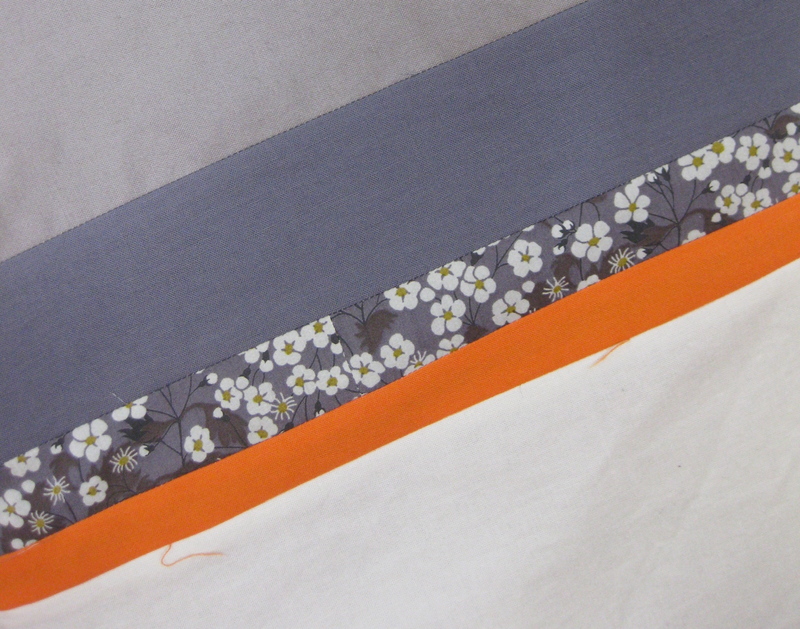 I added two thin strips of orange and a floral Liberty print to one side to add some interest. I also chose to use the main color as the outside edge on one side, and my third color (Kone bone) to the bottom and other side. I also added a tiny patch of the Liberty print to the right side and a patch to one corner, which was the result of changing the design midstream and rearranging some sections. These little details make a big difference in such a simple design. So, I highly recommend sloppy measuring and haphazard piecing. 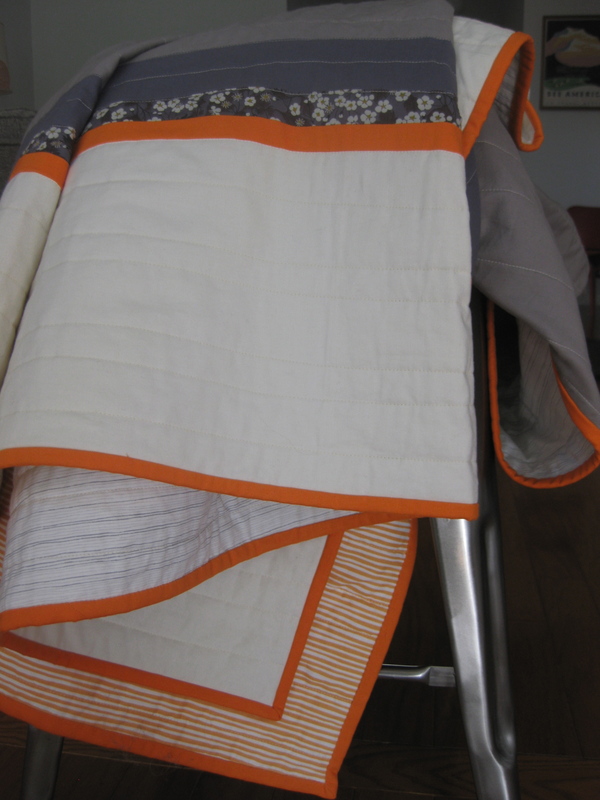 I used a mix of wavy line prints for the backing and quilted on my home machine in a loose straight line pattern. I finished with a bright orange solid for the binding. I hope this not very specific pattern gives you an idea of how the quilt was made. There is plenty of room for improvising! The cushion below is another adaptation of a simple housetop design. This time I used more colors and was very precise with my measurements. It gives a totally different feel. This entry was posted in pattern, quilts on May 3, 2014 by brigitdermott.